Does anyone know where it says that in the times before moshiach, it will cost a barrel of money to buy a loaf of bread? I remember hearing that, but can't find the source. The dollar has lost 96% of its value since #TheFed was created. By printing so much money, the Fed risks vicious inflation. So far, inflation has been mild, but when inflation increases, it happens quickly. 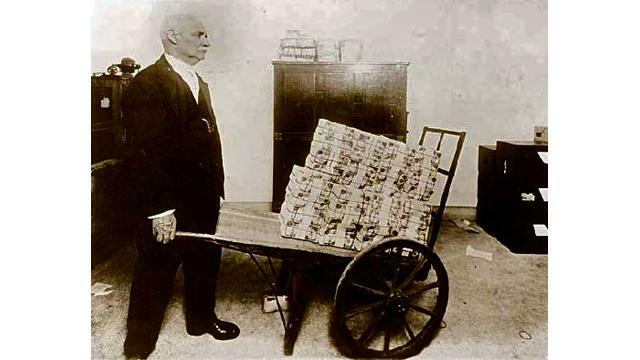 I fear that soon, if we want to buy a loaf of bread, we’ll have to carry a wheelbarrow full of cash to the grocery store. STOSSEL tonight at 9PM on Fox Business. The quote you're looking for is from the New Testament. And I heard a voice from among them say, "A loaf of wheat bread will cost a day's pay..."
The context of this quote is the Apocalypse (aka End of Days). As mentioned by @Fred, this actually happened in Germany in the years leading to WW2. The Gemara in Sotah (49b) says the price of wine will increase, but as far as I know it doesn't say the same about bread. Not the answer you're looking for? Browse other questions tagged sources-mekorot money messiah bread quotations . Source in Jewish writings for Moshiach? Is there any source for throwing bread during tashlich? Source for # times chai?